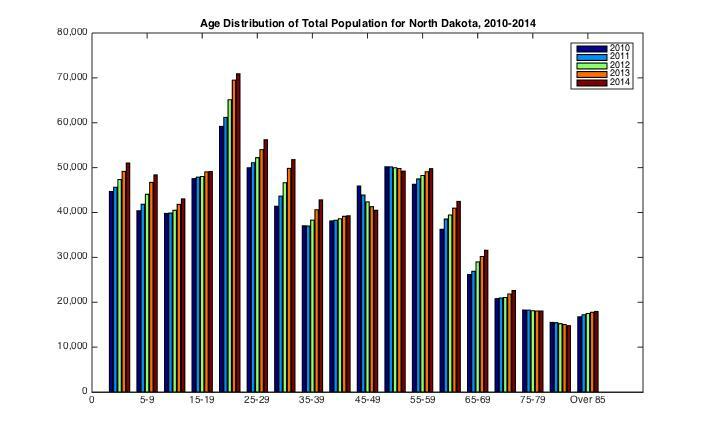 This is the breakdown of North Dakota population from 2010 to 2014 (the mid-year estimates) into the standard five-year age categories. So what do you want to look at? In this case you want to look at the slope of the collected bars. Each of these clusters is like its own line graph for what population in that age category looked like over this five-year time span. So what do we see? Notice the sharp upward shape in many of the age categories? The 20-24 age category has an incredible upward slope. So do the 25-29, 30-34, and 35-39 categories. What does this mean? Given the ages we are talking about this is obviously not due to births. It also is unlikely that mortality had a significant impact on these age categories. There were no major wars or disease outbreaks, and disease would be unlikely to impact these age groups as severely as others. Most of this is likely due to migration changes. Fewer working age people likely left North Dakota over this time due to weak economies in other states and a strong economy in North Dakota. At the same time more people likely looked to come to North Dakota at this time for the same reason residents stayed. There are really only a few age ranges where the population count fell over this time: 45-49, 50-54 (slightly), 75-79, and 80-84. This is really an amazing economic/demographic story for North Dakota.